Sky Rink is proud to offer the premier adult hockey leagues in the New York metropolitan area. The Sky Rink Adult Hockey Leagues are divided into 11 divisions based on the skill level of the players and the team. Teams play 5-on-5 plus a goalie for three 15-minute periods. The leagues operate under the rules and regulations of the U.S.A. Hockey Authority/Sky Rink Adult Hockey Rules. Teams play 5-on-5 plus a goalie for three 15-minute periods. The leagues operate under the rules and regulations of the U.S.A. Hockey Authority/Sky Rink Adult Hockey Rules. The Adult Hockey League offers 11 divisions based on skill level. Levels range from Division 1 (advanced) to Division 8 (beginner). Please click on the division classifications tab above for division game nights and start times. All interested individuals are encouraged to attend the scheduled Evaluation Session. Full equipment (including facemask) is required. All participants must create an account in DASH to register for the evaluation. If you are unable to attend the evaluation, please contact Adult Hockey Director Dan Genovese for an evaluation form at 212.336.6100 ext. 6579 or email genovd@chelseapiers.com. Stay cool on the ice during the summer with the 4-on-4 Adult Summer League! Rosters are limited to twelve skaters, three alternates and one goalie. An emergency goalie may be registered for each team. Rosters are due before each team's second game. The 4-on-4 Adult Summer League consists of four divisions based on skill level. Each team is guaranteed 8 games. The League Committee reserves the right to disqualify experienced players from competing in lower divisions in order to ensure fair and competitive play. All players must be on the roster. Any use of illegal players results in a forfeit by the offending team. Players may only play on one team in their division. All players on the winning team in each division receive a $100 credit toward the fall season. Each game consists of two 25-minute running time periods. The final two minutes of the second period are stop times if the score is within two goals. There is also a five-minute warm up before the game and a two-minute intermission between periods. If a game ends in a tie, the winner is determined by a 3-player shootout. If the game is still tied after 3 players shoot, the winner is determined by a 1-on-1 sudden death shootout. All members of the team must shoot once before a player may shoot a second time. There are no coincidental penalties. Play may go down to 1-on-1, with penalties assessed. Line changes may only be performed "on the fly" or after goals, penalties and pucks out of play. Line changes are not allowed during play stoppages. All interested individuals are encouraged to attend the scheduled Evaluation Session. Full equipment (including facemask) is required. If you are unable to attend the evaluation, please contact a league director to request an online evaluation form. Contact Adult Hockey Director Dan Genovese at 212.336.6100 ext. 6579 or email genovd@chelseapiers.com for an evaluation form. Game days for the 4-on-4 League have yet to be decided. All games will be played Monday through Thursday with each team playing 1 or 2 Sunday games. Teams play 5-on-5 plus a goalie for three 15-minute periods. The leagues operate under the rules and regulations of the U.S.A. Hockey Authority/Sky Rink Adult Hockey Rules. The Adult Hockey League offers 11 divisions based on skill level. Levels range from Division 1 (advanced) to Rec League (beginner). Next Evaluation Session: Thursday February 7 at 8:30pm. If you are interested in joining the Spring League contact Danny Genovese at genovd@chelseapiers.com. Division I is a highly competitive division with a high level of skill and team play. Most players have played college, Junior A and/or professional hockey. Games are played on Thursdays at 8:30pm, 10:00pm & 11:30pm. Division II has a lower level of skill than Division I, but remains highly competitive for players who have proficient hockey skills. Most players have experience at the college, high school and amateur hockey level. Games are played on Tuesdays at 8:30pm, 10:00pm & 11:30pm. Division III is a slower pace game for hockey players who have had experience at the college, high school and amateur hockey level. Games are played on Mondays at 8:30pm, 10:00pm & 11:30pm. Division IV is almost identical to Division III in that it is for hockey players who have had experience at the college, high school, amateur hockey level and/or in an adult hockey program. The pace of the game is slower than Divisions I & II, but equally as good as Division III. Games are played on Sundays at 2:30pm, 4:00pm, 5:30pm, 7:00pm, 8:30pm, 10:00pm & 11:30pm and Wednesdays at 10:00pm & 11:30pm. Division V is for hockey players who possess good puck handling, skating, passing and shooting skills. Division V is divided into an “A” Division and a “B” Division to provide a better level of competition. Games are played on Sundays at 2:30pm, 4:00pm, 5:30pm, 7:00pm & 11:30pm and on Wednesdays/Thursdays at 10:00pm* & 11:30pm. Division VI is for hockey players who possess good puck handling, skating, passing and shooting skills. Division 6B is played at a slower pace than 6A. Games are played on Thursdays and Fridays at 8:30pm, 10:00pm & 11:30pm. Division VII is for hockey players who possess good puck handling, skating, passing and shooting skills while maintaining competitive league play. Games are played on Fridays and Saturdays at 4:00pm, 5:30pm, 7:00pm, 8:30pm, 10:00pm & 11:30pm. Division VIII is for hockey players who possess good puck handling, skating, passing and shooting skills while maintaining competitive league play. The pace of the game is slower to that of Division VII. The Adult Recreational League is for beginner hockey players with one year or less of organized playing experience. This division is for players who are still new to the game and need to improve on basic skills while participating in a team play setting. Games are played on Sundays at 4:00pm & 5:30pm. All Sky Rink Adult Hockey (SRAH) games are to be played under USA Hockey rules. The following rules are unique to the SRAH program and are enforced on top of the USA Hockey Rulebook. 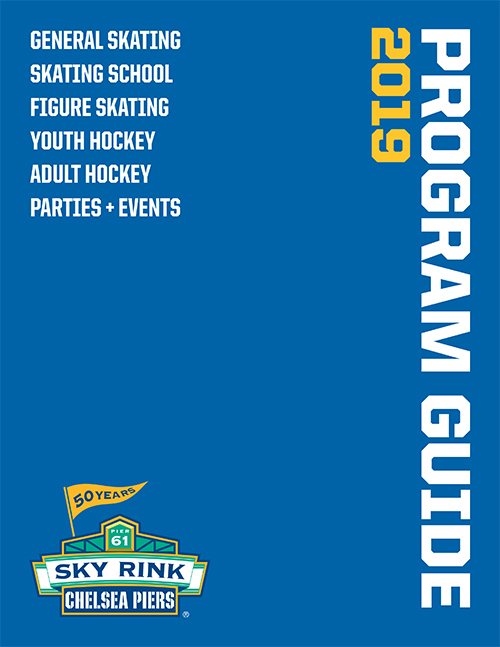 Chelsea Piers – Sky Rink is a non-USA Hockey sanctioned facility, which means all adult teams and players participating in SRAH do not need to be registered with USA Hockey before participating in a SRAH game. Referees are certified by USA Hockey and follow the USA Hockey Rulebook. SRAH teams will be entitled to a full five-minute warm-up. At the scheduled time indicated on teams respective schedule. For example, if the team is scheduled to start at 8:30pm and ice is ready at 8:20pm, the five minute warm-up will not start until 8:30pm. At the conclusion of a prior game that has finished late, only after the ice has been resurfaced and the Olympia doors are closed will the warm-up start. Upon a tie, a five-minute overtime will be played. The first four minutes will be running time with the last minute being played stopped time. Tie games will then be decided by three-player shootout. Sky Rink will provide two (2) referees, one (1) timekeeper and about 20 warm-up pucks. During ice resurfacing between games, NO PLAYERS are allowed on the ice. Players may take the ice only after Olympia doors are closed. Each team roster is to have no more than 20 skaters and one goalie. D7 and D8 teams may roster 23 skaters and one goalie. The Director of Hockey must approve mid-season roster changes due to injury or other unforeseen circumstances. Pre-rosters must be posted on the website by each team’s first game. Final rosters must be posted by each team’s fifth game. The final roster must be emailed to the league director so he can have a hard copy that can only be changed upon request. All roster checks must be requested before the start of the game or before the start of the second period. If a roster check is called and the player being called out is actually on the roster, the team who calls for the check gets a two-minute penalty for delay of game. If the player is not on the roster, he will leave the game and the team will get a five-minute major served by the captain (or acting captain) and the captain could possibly face suspension. Additionally, if the player that is not on the roster has any goals in the game, the team who called the roster check will have the option to take a forfeit win. Also, please remember that most captains understand how difficult it is to field a full team on specific nights/times. Most of you guys are friends and can relate to the difficulties of being a captain. The Adult Hockey director is open to the connecting of captains to discuss the use of a player for a game if need be and allowing another team to give approval to use a player if needed. Hopefully this can be done as a last resort. Each team will be required to wear matching jerseys throughout the course of a season. All players will need a matching team jersey with a number on the back that correlates to the roster. Any player found to be skating in a non-issued team jersey will not be allowed to play in that game unless the director approves beforehand. All changes to the schedules will be updated on the website as soon as the changes arise. Captains will receive email notification about game changes and rescheduling. SRAH referees are appointed to games by the Head Referee. Referees are at all times in full control of events leading up to, during, and after each SRAH game. Referees are never allowed to cut the five-minute warm-up short for any reason. All referees decisions off-ice and on-ice are final. The Director of Hockey is only entitled to add to referees’ decisions, (i.e. Supplementary Discipline), never to overrule referees’ decisions. All complaints must be made after showers. Complaints will not be listened to while captains or players are still dressed in hockey gear. Each complaint will be handled promptly and action will be taken as soon as all the facts have been obtained and considered toward the final decision. Upon the calling of a five-minute major, the game misconduct to follow is up to the decision of the referee. Referees may assess penalties after the game, which includes the lobby and dressing room area. Any player assessed a game misconduct penalty is required to sit out the next scheduled game or multiple games. Any player given a game misconduct on a play which injures another player may not return from the suspension until the injured player returns. Any player found skating while suspended will forfeit the team’s game at hand and sit out the next two scheduled games. Any player who plays in two divisions and is assessed a game misconduct in one division is required to sit out the next scheduled game in that division only. The player may play in the other division unless the league director says otherwise. Any player given three game misconducts within a division during a season at Sky Rink will be suspended for the remainder of the season. The captain is fully responsible for relaying the suspension information to the penalized player. Any captain found to be skating a suspended player will forfeit the game at hand and sit out the next two scheduled games. The Director of Hockey reserves the right to add “Supplementary Discipline” to any players’ penalties, but does not have the power to overrule the decisions and penalties assessed by the referees. In the event of a team not having a goalie for a game, captains may call the Adult Hockey Office for a replacement or access the emergency goalie list that will be distributed via email to all captains. If a team does not have a goalie to start the game, that team will forfeit. We will not allow six skaters (one playing goalie) for an entire game due to injuries to players in the net without adequate equipment. A team must have a goalie to start the game. In the event of a goalie being given a game misconduct during a game, the team must finish the game with no goalie and six skaters. No skater is to stand in the net and take shots. If this happens, the team will automatically forfeit the game. Teams may play 4on4 if one team shows up with no more than four players, but at least four players and the opposing team must agree to play 4on4. A team starts the game with five players; three players from that team receive penalties, not allowing the game to continue with 5on2. A player that receives four penalties in one game will be ejected from the game. In the event of a three-team or higher tie, Head to Head will not be used and the first breaker will be Wins. Overtime games in the regular season will be played 4on4. If the score is still tied after the first three shooters, a sudden death shootout will take place with one player from each team going until one scores and the other does not. In divisions with nine or less teams, the top four teams will make the playoffs with #1 vs #4 and #2 vs #3. The winners will advance to the Best of Three Championship. In divisions with ten teams, the top six teams will make the playoffs. The first and second seeded teams will be granted a bye in the first round. In divisions with 11 or more teams, the top eight teams will make the playoffs. Each round, the winning teams will be reseeded based upon the final divisional standings. All players are to participate in SRAH wearing full equipment. Any player caught using broken equipment will not be allowed to continue playing until the equipment is fixed to avoid injury to player and opposing players. Cats-eye cages and masks without attached chin-ups are not allowed. Players found playing with these will not be allowed to play until they meet the approved requirements. Half-shield may be worn by Division 1 players only. Half-shields may not be turned upside down and attached to the helmet. Please review these rules and regulations. If you have any questions, comments or concerns, please feel free to ask at any time.